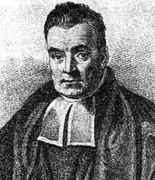 Thomas Bayes was an English clergyman who set out his theory of probability in 1764. His conclusions were accepted by Laplace in 1781, rediscovered by Condorcet, and remained unchallenged until Boole questioned them. Since then Bayes' techniques have been subject to controversy.